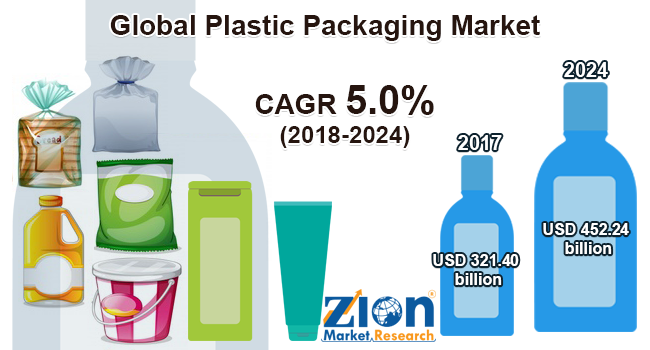 Zion Market Research has published a new report titled “Plastic Packaging Market by Product (Rigid and Flexible), by Application (Industrial, Food & Beverages, Automotive, Personal Care, Medical and Other Applications): Global Industry Perspective, Comprehensive Analysis, and Forecast, 2017 – 2024” According to the report, global plastic packaging market was valued at USD 321.40 billion in 2017 and is expected to reach USD 452.24 billion in 2024, growing at a CAGR of 5.0% between 2018 and 2024. In terms of volume, global plastic packaging market stood at approximately 9,621.11 kilotons in 2017. Plastic packaging is used to pack various products as it is one of the most convenient materials for packaging. It has the ability to get molded easily. Moreover, it is easily available at a lower cost in the market. Thus, it has great demand in the packaging industry across the globe. The global plastic packaging market is largely driven by the growing food and beverages industry especially in developing countries such as China, India, Brazil, and South Africa. Growing disposable income due to the escalating industrialization and globalization around the world has led to the drastic change in the lifestyle of the people, especially in the developing countries. This factor helps to increase the demand for personal care products, which in turn grows the demand for the plastic packaging market. However, the imposition of stringent rules and regulations on usage of plastic may hamper the market growth. Nonetheless, growing exposure to the untapped markets especially in developing regions may explore the new opportunities of the market in the near future. Rigid and flexible packagings are the two major types of the global plastic packaging market. Flexible plastic packaging led the global plastic packaging market in 2017. It accounted for more than 65% share of the total market value in 2017 and it is also expected to exhibit its dominance over the market during the years to come. Rigid plastic packaging segment is also expected to grow at a moderate pace over the forthcoming years owing to the increase in the packaging in medical and automotive industries across the globe. Based on applications, the global plastic packaging market is categorized into industrial, food & beverages, automotive, medical, personal care, and other applications. Food and beverages lead the application segment of the global plastic packaging market in 2017. It accounted for more than 30% share of the total consumption of the market in 2017. Moreover, the food and beverages segment is expected to be the fastest growing segment of the market over the coming years owing to the growth of the food industry including the dairy industry around the world. Growing consumption of dairy products is likely to propel the demand for flexible as well as rigid plastic packaging in the next few years. With the significant share of the total market, Asia Pacific led the plastic packaging market in 2017. Surging automotive, food & beverages, and personal care industries are projected to impel the market’s margin over the upcoming years. North America and Europe are expected to exhibit moderate growth in the near future. Latin America and the Middle East & Africa are likely to witness remarkable growth over the next few years. Some of the major players of the global plastic packaging market are Mondi Plc, Ampac Holdings LLC, Bemis Company, Inc., Ukrplastic Corporation, Amcor Ltd., Constantia Flexibles International GmbH, Wipak Group, Sealed Air Corporation, Huhtamaki Oyj, and Sonoco Products Company, amongst others.